For example, in October law firm Blank Rome announced that they were the first firm to roll-out the Surface Pro 3 firm-wide for all legal employees. Curious as to why the Surface Pro might be gaining ground in Legal? Here’s Microsoft’s hook: lawyers live in Word and Outlook. Try using the Word app on iPad (although very good) compared to full Word on a very light Windows computer with a handy keyboard. Need I say more? What PRIMARY brand of notebook/laptop computer was the last major purchase you made for your firm? 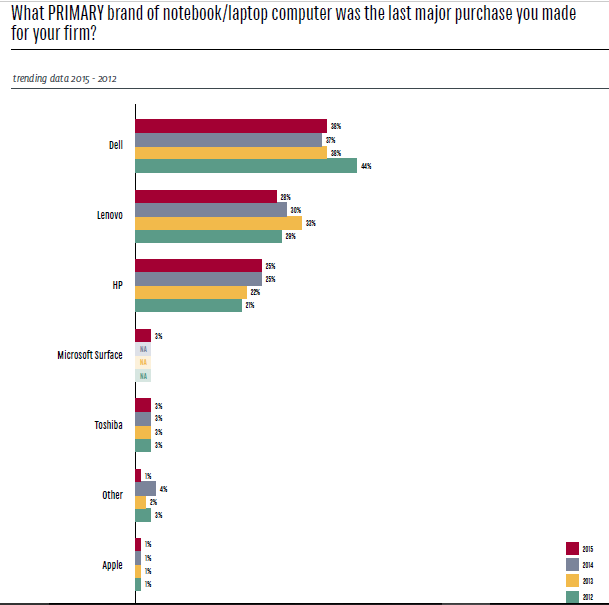 It’s no surprise that Dell, Lenovo and HP currently lead the pack in laptop usage. But Microsoft Surface debuts at 3%. In contrast to Legal, if your tech company is within 50 miles of Cupertino, don’t even dream of trying to hire top talent without offering some flavor of the MacBook. 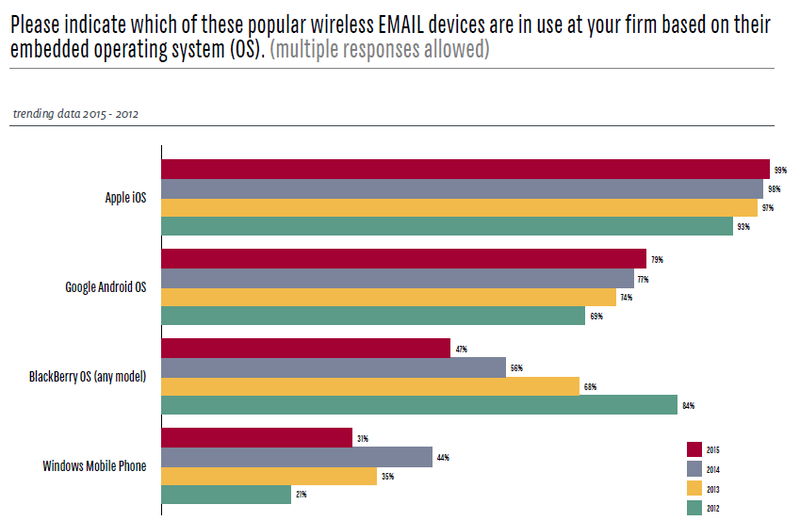 While MacBook usage may be relatively low today in Legal, we do see adoption, especially at the larger firms. Is Surface Pro Really in the Race? 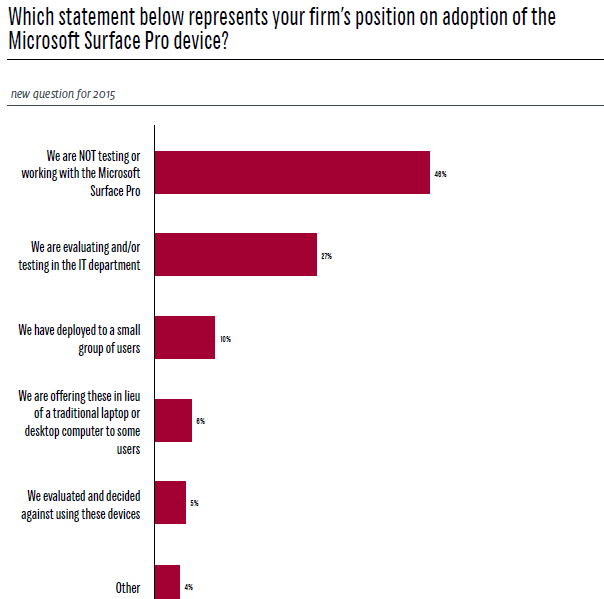 Which statement below represents your firm’s position on adoption of the Microsoft Surface Pro device? How interested are Legal teams in Surface Pros? tallies up to a tidy 43% of firms seriously considering using Surface Pros. Quoting Jeff Richarson, aka @iPhoneJD, the “ILTA survey shows that virtually all law firms support the iPhone, iPad.” Indeed. 99% of firms have iOS devices in use. Android is at a healthy 79% today. This is a number to watch, however, as some firms have cut back on allowing Android devices due to the difficulty of upgrading for security patches. BlackBerry, once the lifeline in Legal, is at 47%, down from 84% in 2012. Windows Phone is losing ground as well at 31%. What do you think? Is the iPad too sleek to be unseated by the Surface Pro? Does Word trump all? My next post – 3 intriguing points on mobile security from the 2015 ILTA Technology Survey. The 2015 ILTA Technology Survey of 420 firms is summarized at InsideLegal. This entry was posted in HelixPulse Blog, Legal Technology, Mobile Productivity, The Future of Legal IT and tagged ILTA, iOS, Legal IT, Surface Pro by Maureen. Bookmark the permalink. A couple of quick points. “…lawyers live in Word and Outlook.” That may be true for some lawyers, but not because they want to live there. We just haven’t offered them any other choice. Word and Outlook are clunky and productivity robbing. A much better platform would be some sort of secure collaboration tool. Something like Sharepoint was originally marketed to do but also became clunky and productivity robbing. The Surface Pro keyboard stinks. If you’re piloting the Surface Pro do your lawyers a favor and give them a better keyboard option. There currently isn’t any other keyboard that snaps on the same way the MS keyboard does, but there are a few really good bluetooth options out there that are far better and worth the minor inconveniences. Or do them a favor and step up to the Surface Book which has a much better keyboard than the Pro.